Change That Matters is for leaders who have the courage to change. It delivers on promises to show you how to step into the winner’s circle by leading a critical transformation in your organization. This book is strategic, practical, tested and customizable. The Adaptive Path framework makes people-centric adoption not just possible, but highly attainable. It is no accident that our model is well positioned to deal effectively with whatever the future tosses your way by guiding the process of building “change muscles” on a day-to-day, moment-by-moment basis. 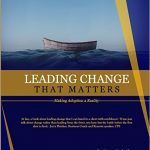 Change That Matters acknowledges the difficulty inherent in effective change leadership and in finding a path that is sustainable for the organization, its leaders and the employees. Change Management is ultimately about getting results. The Adaptive Path framework prepares you and your staff to learn to navigate chaotic, unplanned change even as you embark on a high stakes planned shift in how your organization operates. Change That Matters, Making Adoption a Reality is based on an effective change implementation model that has been tested and proven in two decades of client engagements in Asia, Africa, the Middle East and most recently in the Americas. It has been successful because it puts people at the heart of making the desired transition and develops skills they will carry with them to lead future change. This body of knowledge on change is led by two working experts in the field. They know when to step back and when to intervene so that your emerging skills support you in leading change that gets the right things accomplished.